The importance of touch in humans as well as animals is well known. Bodywork has been shown to relieve stress, improve circulation, decrease pain, and promote healing. There are many different types of bodywork that can be beneficial for animals. Here is some information on just a few. Massage involves physical manipulation of tissues. Benefits of massage for dogs includes decreased stress, relief of aches and pains, socialization and enhancement of the human--animal bond. Yes, dogs have their share of stress too! Dogs can suffer from storm phobia, separation anxiety, and even react to their owners stress. Massage improves circulation, stimulates the immune system and promotes relaxation. Deep massage on dogs requires knowledge of anatomy and should be performed by a licensed practitioner. There is no reason though that you can’t give your dog a light relaxing rub down at home right now. Take a few deep breaths to clear your mind. Relaxation is the most important part of massage. Never force your dog to submit to a massage if he is really not interested. Talk quietly to your dog until he or she is relaxed. Run your hands gently over her in the direction of her fur, from head to tail ,and down each leg. With the palm of your hand flat against her shoulder using firm but gentle pressure, move your hand in firm circles so that the skin moves over the muscles. Repeat the motion in different places around her body. Run your hands down the length of each leg gently massaging those muscles. Gently rub each pad on her feet. 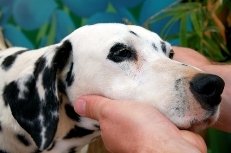 Using your fingertips massage the small muscles of her forehead, cheeks, muzzle and ears. Finish with the same slow gentle strokes you started with running from head to tail and down each leg. Then sit quietly with your dog for a few minutes. Acupressure is an ancient Chinese healing practice based on the principles of acupuncture. It is a way of releasing blocked energy or “qi” in the body. Acupressure stimulates the body’s natural healing abilities. Benefits include decreased chronic pain, increased mobility, relaxation and improved immune function. For more information visit the website of the American Academy of Veterinary Acupuncture or contact your local veterinarian to find a veterinary acupuncturist near you. Tellington Touch was developed by Linda Tellington-Jones as a means to work with problem horses using bodywork and movement. She later adapted this approach to work with companion animals as well as people. It is a method based on circular movements of the fingers and hands all over the body. Tellington Touch helps to release tension and increase body awareness. It can be used to calm and focus as dog who is distractible. It can help a fearful dog become more confident, and be used to calm a dog in a stressful situation. To learn more about Tellington Touch visit the Tellington Touch website , or check out the following books.